Since Expeditie Geluk, the let's-walk-around-the-Netherlands-epic I have a Suunto Ambit watch. The watch does more then just show the time. It's an alti/barometer, compass, heart rate monitor, time keeper and most of all also a GPS watch that can be connected to the internet. I got the thing for free for Expeditie Geluk. Free is always a good color. Now the watch does some fun things that weren't possible in 'old style' running. Of which planning a tour is the most important one. I haven't ran 'dicks' yet, but yes you can. Or flowers, or cars, or whatever figure you like to plan. So let's start with a short review and tell you something about my training and the watch. Now I have an older version of the Ambit (the Ambit 1.) and I saw the newer version that have no sharp edges at all and are less bulky. I don't know if anything to the battery life/software options changed. The battery life is fine for any regular use, just when you'd do a multi-day alpine tour you'd get trouble with the battery life. Also, when you get in more extreme temperatures the thing gets pretty slow (but still works) up to -25ºC. Below that it starts to get issues, the screen can fog up with -15ºC, it doesn't show the temperature anymore with -35ºC and it will completely stop working around -40ºC (figured this all on our last Alaska adventure this Spring 2014). Not that any other 'smart-watch' will work with these temperatures though. Oh, and it doesn't link up with your iPhone or any phone either. Which isn't needed anyway because anyone who brings their iPhone on a run or a climb isn't climbing/running anything serious enough anyway. I mean, running with our iPhone in your pocket is just not comfortable when you run more then 2km. Next to that, the route, your HR, timing and everything is in your watch, so the phone-with-running-app isn't needed anymore. The newest version does link with your watch and you can read texts on your watch through Bluetooth or something. So. What I use the watch for. So alternative training sessions. 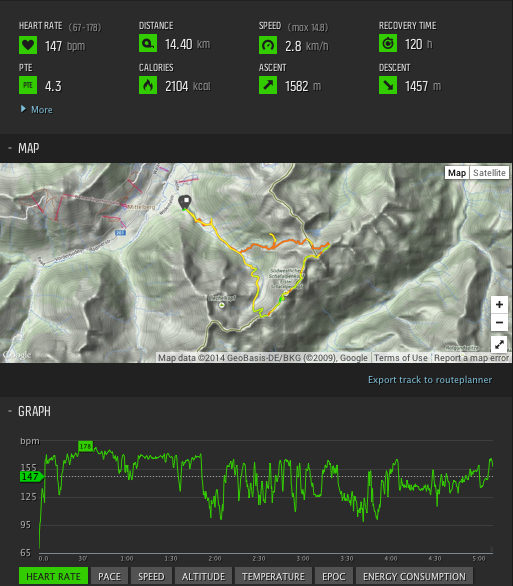 Cycling, running, bouldering, and on my free Monday I do a scramble + long run. Interesting thing to see are the route, calories, recovery time and heart rates. The route. As you can see somewhere in the upper middle of my run-hike-scramble I went the wrong way. The path I took to the hut wasn't pre-set in the map so I had to draw a line myself and guess the direction to the hut and the start of the viaferrata. I made a wrong guess and ended up a different route. After a while I realized it wasn't the right way and I had to go back. It would be useful to see more in the screen of the watch then just the line. Interfering roads, paths and landmarks for example. But my Ambit isn't that smart (yet?). Also the map used to draw the route isn't super accurate (Google maps) for some complicated turns and altitude differences (for example when mountaineering/climbing) a more accurate map would be very useful. 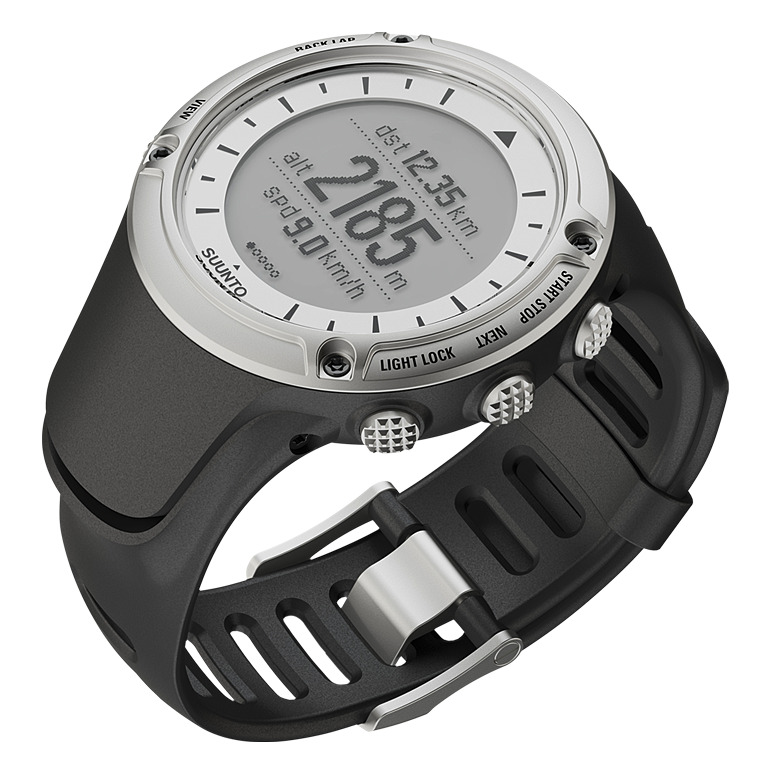 This missing feature combined with the battery power (when in full use it lasts just a day) it still isn't the mountaineering watch it claims to be. HR: When I do a really intense drytool session my heart rate doesn't go up to max, but my body gets really tired (I had muscle soreness after the Thursday drytool session). But following my watch I hardly have any recovery time after the session (my body tells a different story...). Recovery: Last run + scramble took me just over 5 hours of non-stop movement. My watch told me I'd need 130hours of recovery. At the end of the day during the drytool session I was too tired to do full power movements. But today I felt okay again. Calories: I always wonder who invented that thing. Did I really use over a 1000 kCal on that Monday run? And just a 300 kCal on the drytool session...? Although these numbers aren't probably completely correct (for example sometimes the GPS signal gets lost or my heart-rate band disconnects) it's still a good thing to get a view on what my fitness level is. Basically it tells me every time again that I can run faster, climb more and cycle longer. To get a better view on what I mean with 'drytool training' here a little video of last week's session. 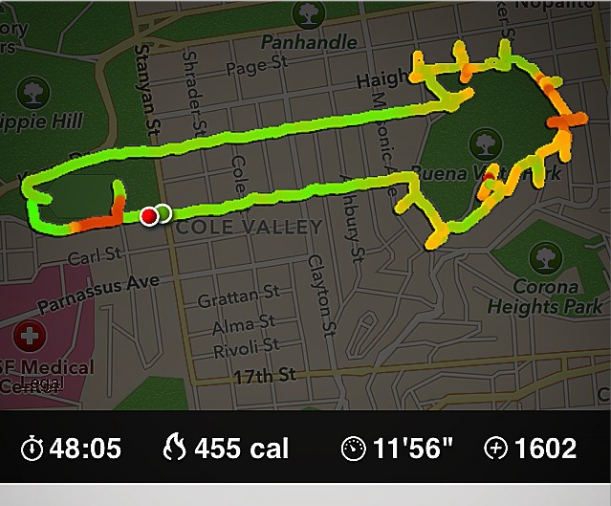 Handy: use runs/training sessions of others around you to plan your own run. Drytool training July 2014 from Marianne van der Steen on Vimeo.